What To Put in A Wall Niche And Other Fixes for Design Disasters — KTJ Design Co. I've been doing this designer gig going on 8 years. In that time, I've made several keen observations based on visiting hundreds of homes during this timespan. This is nothing too scientific, just my hypothesis on a few of the biggest design disaster complaints I get from homeowners. I believe in the seventies some architect decided that making sunken rooms was a good idea. How making a tripping hazard is a good idea is beyond me. What did they think everyone wanted a love pit? It just looks dysfunctional and it's a bad idea. Along comes the open house tours and some fancy-pants journalist for a big home magazine wrote “New Trend - No Hardware on Kitchen Cabinets!! !” This “trend” continued throughout the eighties and it's another bad idea. First of all you can’t easily open the cabinets, and when you do your hands make them dirty. Hence all the homes with honey oak cabinets (another 80’s trend) covered with grime on the lower edges. Ah, yes. The era of your mass-produced production houses ushers in the 90’s. This one is totally on the architects. They were thinking how can we give these builder grade homes a little architectural element that will be cheap to build? Voila! The wall niche was born. This is the bane of all homeowners and designers because what the hell do you do with this randomly placed hole in the wall either at the end of a hallway or around the fireplace? It's good for... nothing! The McMansions of the 2000’s brings us to the uber tall ceilings. Granted, an eight foot tall ceiling is a little low, so I am all in with a 9 foot or even 10 foot ceiling. But those ceilings that are 12 feet or more - seriously? Why? The biggest question is, “How do I get rid of the echo?” Why does it echo? Because not only are the ceilings 12 feet tall, but all the floors are covered with travertine tile (see this blog about my opinion of travertine)! So you might be wondering what are solutions for all these ill-conceived trends? Sorry, short of rebuilding the sunken floor, there is no easy solution. However, I do suggest a flooring change, like carpet to hardwood or vice-versa so people don’t trip. I truly believe that some contractor has a storage unit filled with all the cabinet hardware that he forgot to install. I used to watch Storage Wars and was just waiting for them to pop open the door of a storage unit filled with boxes of oil rubbed bronze cabinet hardware. I wonder, is that show still on? Cabinet hardware (or the absence thereof) is actually the easiest fix of all these design disasters. You simply go buy some and install them. Here are three of my favorite brands and you can find a plethora of door hardware. In fact, go to Home Depot or Ikea and you can grab some pretty cool ones on the cheap. Use all door pulls and mount them horizontally. Put knobs on the doors and pulls on the drawers. Put pulls on the drawers and knobs on the doors. It doesn’t really matter - just put hardware on the cabinets, damn it! Wall niches actually crack me up because I am pretty sure this idea came from an architectural student trying to be creative. Oh well, better luck next time dude. 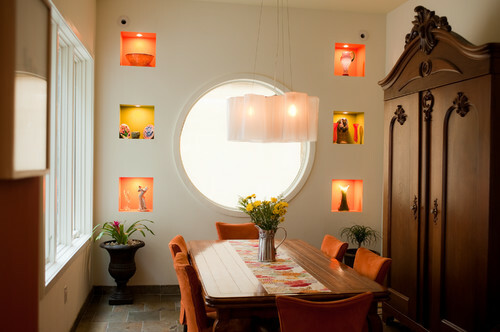 As for the wall niches here are few ideas. Paint the insides (back and sides) are really bright, bright color. Install glass shelves and make a little memory box (change it out for the seasons). Add a semi-circle ledge at the bottom so you can place a plant on it. Add a small puck light at the top. If niches are really driving you crazy - sheetrock over those bad puppies and be done with it - that’s what I would do! The problem with tall ceilings is bringing the volume of space between the floor and ceiling together. Here are a few ideas to cozy up the space. Add texture to the top of the ceiling. Check out Amourcoat for some great finishes. Add a drop ceiling to a portion of the room, for instance in an open floor plan delineate and separate the rooms with varying ceiling heights through drop ceilings (like the kitchen). 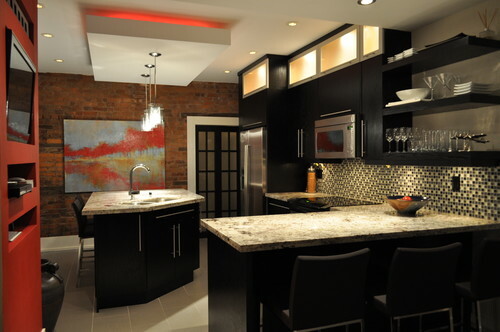 Add a bulkhead around the perimeter of the room with up-lighting. Remember - the right designer can address all your built in design disasters and more. If you've looked around your house and realized you NEED more design advice - straight up, no chaser! - sign up for my email list to get my best “Inside Story” advice delivered directly to your inbox.